This three-story Victorian with a wide front porch is the kind of house I brake for when I’m driving through a neighborhood. Built in the 1860s, it’s on the market for $729,000 in Terrace Park, a scenic village known for its beautiful older homes in Ohio–take a look! I’d spend my summers on this porch. Love it. The house seems to have great bones, and it doesn’t look as “fussy” as some Victorians tend to be. Wouldn’t it be fun to decorate? There are 6 bedrooms and 3 baths. I grew up in a neighborhood full of old houses and a lot of them had second-story “sleeping porches” like this one–and I always wished we had one, too. The kitchen has been updated but still looks like it belongs in an older home. I’m always relieved when I see one like this that hasn’t been modernized with acres of granite countertops and stainless steel. Want it? For more photos and information, check the Coldwell Banker West Shell listing. Hi Julia I’m with you that porch cups of tea in our winters and very cold drinks in our summers it’s beautiful. The inside is going to take talent and lots of $$$$ to renovate. I don’t know about you guys over here it’s very expensive just to buy the house, to renovate is another story. It’s a cool Sunday afternoon I’m sitting here watching National Geographic – Yellowstone it’s making me feel sooooo cold. Till next time Regards Esther from Sydney. PS hope you are enjoying your weekend. I don’t see anything that needs renovating. Maybe different paint colors but that’s it! I agree, just some paint and wallpaper changes, if the existing is not to the buyers taste. Nothing expensive needs to be done, that I saw. What a beautiful, comfy, we’ll lived in home! This seems like one you comfortably move into and make your own. It looks like it has had some updates, but the structure and character are still in tact. Very, very nice! How lovely! I can only dream of a sleeping porch- you would die outside in Texas heat & humidity 😉 Love how they kept the kitchen looking as if it goes with the time period of the house. It would be fun to see a modern decorating twist on this one! This is a gorgeous house and I would definitely live in it. I am a huge fan of open shelving and white kitchens so I would make that change. I would also take the separate shower out and put a shower connection over the tub to mimic an older bathroom. I’m not a Victorian fan, but you nailed it: this one’s “less fussy” + lots more appealing to me. Ditto on the sleeping porch love. I’d use it as my sewing studio, where I’d happily bask in all the sunshine! 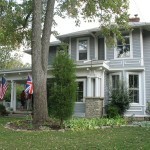 This a charming home, I like the “less fussy” look too. I also agree that the kitchen is a perfect fit with out lots of the popular ( for right now) updates. Ive always liked the idea of a sleeping porch, but I know I am too addicted to my air conditioning in the summer to enjoy it now. Lots of character here! Love that! I’m a big fan of less-is-more-approach in Victorians (which I know runs counter to the Victorian decorating preferences of the day LOL). I grew up in a house with a sleeping porch except my parents did not “rehab right” and closed it in to create an adjoining bathroom for my sister’s and my bedrooms. With one bathroom and two teenage girls I guess it was the right thing to do! Beautiful house. The sleeping porch reminds me of the bedroom I had for several years when I was younger. My parents bought a funeral home that was short on bedrooms, I got the sleeping porch which also had the trap door used to lower caskets down to the embalming room below. I remember roasting in the summer. I didn’t sleep well as a child. Oh my word. That gives me the willies! I would have run away…..
It’s amazing what kids will put up with! They even left caskets in my room overnight. They were empty, but still. I use to put a Barbie on top of the casket. My theory being that if the casket opened up, the Barbie would fall off alerting me to the opening. I use to get in trouble for putting toys on the caskets. I am not a big fan of Victorian partly because I still have “flashbacks” from the period when my mother went into “Victorian Overload” and everything in her house was rose, mauve and flowerly. However, I agree with Kay that this house is less fussy than most Victorians but that wallpaper in the foyer would have to go! Love, love, love Victorians and this one is no exception. It is nice to see a lot of the millwork and fireplaces intact. Great kitchen – nothing too overdone. I love it! There’s really not a ton of things to do to this. A bit of paint and such. You could really move right in unless the systems are not updated. I suspect they are. I love that island in the kitchen. There has to be a story behind it. That porch is lovely. What a gracious home! LOVE the sleeping porch. This house puts me in mind of the the one I imagine while reading A Wrinkle in Time. LOL! I was thinking that the decorating was a little on the fussy side. It would be a really fun house to redecorate in a simpler, cleaner style. Mmmm…it would definitely be a treat to decorate that beauty! What a charming Victorian home. I love the front porch and sleeping porch. I would spend a lot of time in both places. I can’t imagine someone before their 50’s to live in such house. It’s not bad but the styling is kinda old. Love this home. I even like the red wallpaper, which seems to suit the spindlework. Imagine how lovely that red front foyer is at Christmastime! I think part of this home’s charm is that it hasn’t had the daylights renovated out of it. It retains its Victorian flavour without being a slave to overstuffed furniture and fancy dark wood pieces. My kids went to preschool at the church across the street from this home. I always wondered what it looked like inside. Thanks for the tour. Love this house – as it is! If only I lived in America! I used to live right next this house. My friend lives in what used to be the barn behind it! Does anyone have some money that I could borrow? It’s gorgeous. I love that breakfast nook or whatever it is with the bay window. What a lovely home. A sleeping porch sounds nice too.